Slo-Mo, featuring Mic Wrecka, has gotten its buzz back but good. This weekend, they’re dropping the Grade-A, “Gimme What You Got” album (Authentic Records) and celebrating with a couple shows in the home zone. Don’t know from Slo-Mo? 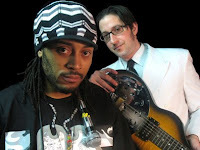 Think a groove-centric, one-of-a-kind blend of slide guitar-fueled blues rock (spirited by the Slo-but-supa six-stringer Mike Brenner) and facile, Philly-flavored rap (by his bud Wrecka, aka Doug Jenkins). On this 4th Slo-Mo set, the sultry vocals of Steph Hayes and Susan Rosetti (ex-Stargazer Lily) and trumpeting of Matt Cappy (Jill Scott, Jay-Z, Roots) really crank it up to 11. World Cafe Live, 3025 Walnut St., noon today and on WXPN (88.5 FM), free, 215-222-1400, www.xpn.org. Also with the Fractals and Adam & Dave’s Bloodline, Johnny Brenda’s, 1201 N. Frankford Ave., 9 p.m. tomorrow, $10, 215-739-9684, johnnybrendas.com. One of our fave XPN locals Slo-Mo featuring Mic Wrecka is back with a new album and better than ever. 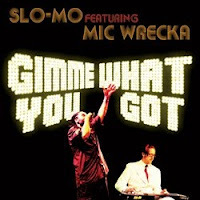 Slo-Mo (Mike Brenner) and Wrecka’s new album Gimme What You Got is classic Slo-Mo and Wrecka, busting out rhymes and pedal steel lines with girl group harmonies, slow jamz and hot groovers. Mike and Mic (get it?) are keeping busy this weekend with a ton of record release partying. The major release party is Sat, Sept 12 at Johnny Brenda’s w/ special guests the Fractals and Adam and Dave’s Bloodline. Also, they’re performing at the Free At Noon concert tomorrow Friday, Sept 11 at World Cafe Live and that same night will be appearing at the Whitaker Center in Harrisburg with David Dye’s Funky Friday Dance Party for another XPN trip out to Central PA.
Generally it’s not my style to ask you to buy an album. I tell you what I think, and then you make up your own mind. That’s the way it should be. This time, however, I am going to make an exception in the case of the Philadelphia band Slo-Mo. The reason is simply this; I want to see this band live.